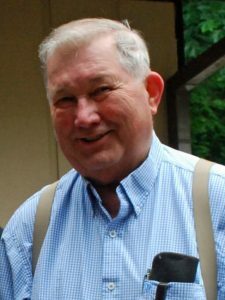 In keeping with John’s can-do attitude, was his large influence in shaping the welcoming nature of SBYC, and making it distinct from other clubs in the area. He will be remembered vividly by friends in and out of the club. John was a Sea Scout in Tacoma, and a Husky Oarsman for the University of Washington. John was a fixer, who solved engineering design problems with the Highway Department, formed his own company to build a mast for the family Buchan 37 and finished the interior with teak. 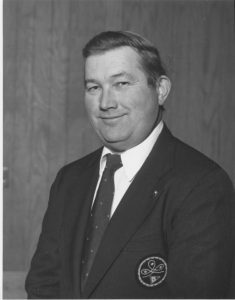 John went “through the chairs,” to become SBYC Commodore in 1984. 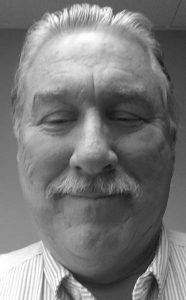 He served on the Race Committee and was the PHRF Handicapper/measurer and RC Boat operator for 20 years. John designed and built Olele, from the hull out, launching her in 1988, a year after he retired. Olele was the principal SBYC Race Committee boat before the interior was even completed. 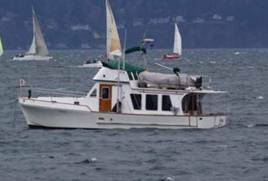 The boat was named after the area around Mats Mats Bay and Olele Point near Port Ludlow where John’s wife, Bonnie Klasell, grew up. In 2000, when it was “time to build a cabin on the beach,” SBYC members Jerry and Pat Hillis purchased Olele, and still operate her as our Race Committee boat! Rubie says that John was one of her most interesting mentors when she took on the RC Chair job on Olele in 1989. OLELE in Feb. 2011 Snowbird Race at Shilshole Bay. Photo by Ben Braden taken while racing. Welcome back everyone from summer cruising and other excellent adventures. We look forward to sharing our travels and summer stories at the September dinner meeting with everyone, capped by a wonderful adventure presented by our guest speakers, local cruising notables Behan and Jamie Gifford. In 2008, Jamie and Behan Gifford left their home in Washington and embarked on a boat trip around the world with their three children. Nearly 10 years later, they still haven’t stopped. Since starting their life on the sea, the Giffords have explored countless new places, learned to live with relatively few possessions, and grown closer as a family. They have written books about their travels and are regular contributors to 48 North and many other publications. See more at their website at www.sailingtotem.com. 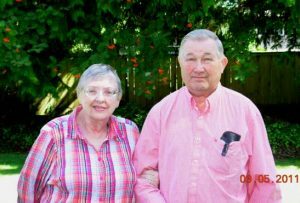 Here’s an opportunity to meet a couple who have made a life cruising the high seas, with Washington their base. Special dietary needs can be accommodated; please let me know. Main course selections are due by 9:00pm on Friday, September 14th. Look for your Evite invitation in your email, then hit Reply and use the Comments field to tell me how many in your party and their dinner selections. Cancellations must be made by 9:00pm the same day. Note that the deadline for reservations is also the deadline for cancelling a previous reservation; otherwise you will be charged for the meal. Dinner is $35 per person. If you charge your meal (credit card), we will add $1 per meal. Please purchase your drinks from the staff in the banquet room. The receipts count towards our room rental minimums. WHEN YOU RECEIVE THE EVITE INVITATION TO THE DINNER, PLEASE REPLY AND USE THE “COMMENTS” FIELD TO TELL US HOW MANY IN YOUR PARTY AND WHAT MEALS EACH OF YOU WOULD LIKE! Race Report by Tom Madden. I hope you have all had a chance to get out and do some cruising and racing this summer! The weather has been fantastic, except perhaps for a lot of smoke from BC wildfires. Lori and I have purchased a new boat, a PDQ 36 catamaran, which we brought up from Florida last winter. We have been fixing her up for northwest cruising all spring. Last month we tried her out with a cruise in the San Juans for a couple of weeks. She is a great cruising boat, even if she is not the fastest racing machine on the planet. 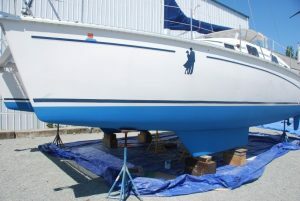 Our PDQ 36 “on the hard” at La Conner for some engine work, fiberglass repair, blister removal/barrier coat and bottom paint. With new sails and a few other modifications, she is now ready to go cruising. Next will be a new name and decals! Remember – I need to know if you plan to participate so I can set the class breaks. That means I need to know by this coming Wednesday at the absolute latest! Again this year, all proceeds from the race will be donated to the Footloose Sailing Association. Last year we donated over $1000 to their cause, and I hope we can continue to support this fine charity that helps get disabled folks out sailing on the water. We have had great support from our local boatyards and chandleries, and will have haul-outs and other fine gifts to raffle off at the after race gathering. We still do not have a regular meeting place, so we will meet at Ray’s Boathouse (upstairs in the bar area) for award presentations and the gift raffle. I hope to again have at least one haul-out per class, as well as many other gifts for second and third place finishers. After that, our regular racing monthly Snowbird series will begin on November 17 and then December 8. Next year’s remaining three Snowbirds will be determined after the SARC meetings in November. So that is about it for the moment. Next report will include the results of the TransPuget, and hopefully some nice pictures. Dues Renewal by Roger Newby. It’s Fall – Club Dues Renewal! Please make a note in your Daytimer/Calendar/Reminder system that the annual club dues need to be paid no later than December 15. Our Dues, while probably the lowest dues in the area for yacht clubs, are nonetheless the key component of our annual budget on the revenue side. So, we greatly appreciate members’ getting this done before the deadline. As you know, we can now take credit card payments at the Dinner Meetings. We plan to have that capability for the Annual Dues as well, but the only way card payment can happen is for us to actually swipe your card. We can’t take your card numbers over the phone and pay that way. Another new payment method that we tested this last year is peer-to-peer electronic payment. Most of the big banks offer this (Wells Fargo calls it “Zelle”; others use other names.) You go to your Bill Payment tab on your online banking account and make an electronic payment using just the recipient’s cell phone number or email address. We’ll provide the specifics on how to use this method in next month’s Rudderpost article on Dues Payment. And, of course, there are always good old-fashioned personal checks. You can do this either by writing a check at one of the upcoming Dinner Meetings or mailing your Dues check to the club P.O. Box. The other important piece of Dues Renewal is to update your information we publish in the annual Club Roster. In the past, we simply asked everyone to fill out a paper form for this. But, in keeping with the progress of technology in our world, we’re planning to provide an online form for this on our website. Again, in next month’s Rudderpost article on Dues Payment, we’ll provide the details. So, plan ahead! Read next month’s article with the key details and then take advantage of the new, easier methods to get your Dues paid right away. Thanks to everyone for your attention to getting this done before the deadline of December 15. You too can beat the Deadline! Purple Passion Cruise by Patricia Shannon-Garvey. 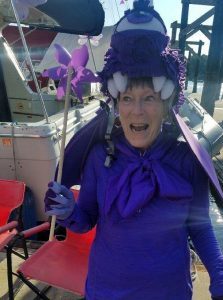 SBYC’s third annual ‘Purple Passion’ Cruise over Labor Day Weekend featured Pat from Olele as an amazing Purple People Eater, with one horn, one eye and lots of purple, dancing to “The Purple People Eater” by Sheb Wooley. Patricia/Slow Dance won the Purple Passion Dessert Buffet on Saturday night for her purple cheesecake. August/Carpe Diem, once again (!) claimed first place in the Purple Passion Cocktail Contest – Carpe Diem has won this contest all three years. Let that inspire you for next year! Sharon/Antares got first prize for her delicious purple potatoes and vegetables in the 50 Shades of Purple Potluck. Of course, Purple People Eater, Pat, won a prize! 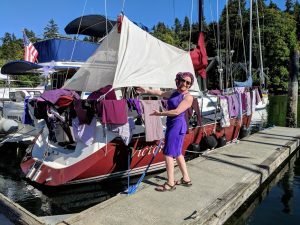 Barb/Victoria won best decorated boat for her incredibly creative Purple Passion Laundry Day! 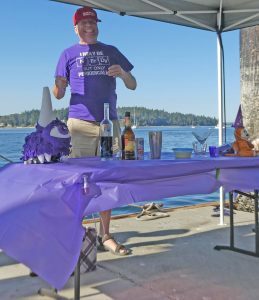 You have a year to perfect your contest entries for the Purple Passion Cruise to Quartermaster Harbor over Labor Day Weekend next year! Salish Sails by Ben Lobaugh. This article reposted [with small edits] from the August 2018 edition of the 48 North Sailing Magazine, written by SBYC member, Ben Lobaugh. If you are interested in participating in the 2019 Salish Sails event contact Ben. On a sunny Saturday in early July, a new sailing event took flight – the inaugural Salish Sails day. 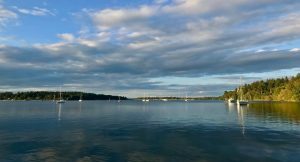 The event, inspired by 48 North, was designed in partnership with local yacht clubs with the purpose of getting new folks out on the water to experience the joy of sailing. Both racing and cruising were available for those interested. I was honored to host seven people on my boat, S/V Billabong. We cast off lines from Shilshole Bay Marina with beautiful skies, big mountains, and moderate winds. I love taking people out on their first sail and seeing the wonder and enjoyment in their eyes as they learn how to steer and trim sails in an exquisite dance with nature. I also delight in their laughter as they try to master a language that exists only in the boating world. Though we started with a southerly, the wind shifted around to come from the north and put us on a direct path to Kingston. One sailor, Bennett, was an old school racer who came to reignite his own passion. He also brought his girlfriend on her first sailing trip. She keenly observed, as he pointed out the various lines, cleats, and other contraptions on the boat and explained how and why they worked. She handily stepped up and both trimmed the sails and helmed like a natural born sailor. I think I see a boat in their future! Nathalie, Billabong’s mainsail trimmer during races, brought a friend along and during a lull in the wind they repeatedly dove off the back of the boat into the chilly waters of Puget Sound. They swear it was refreshing and not cold at all, but I have my doubts! My wife, Alix, brought along a friend who had been wanting to try sailing for some time. They had a delightful time getting the boat moving and then relaxing in the sun on the fore-deck. After a couple hours of indulgence, we tacked toward Shoreline. The wind came and the sails were nice and full. Bennet wanted to give his girlfriend the full experience, so she took the helm and we hardened up to get 20 degrees of heel. She helmed like a pro. We had over four hours of magnificent sailing and inspired four new sailors to join our world of sailing! I am already looking forward to participating in, and growing, next years Salish Sails event! 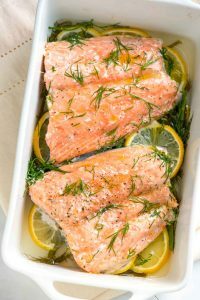 Salmon Bake by Patricia Shannon-Garvey. 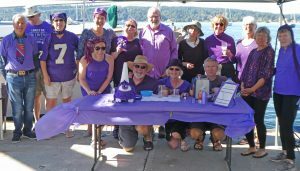 The Salmon Bake, September 29, at the Port Orchard Marina, is the SBYC final cruise of the year. The party is Saturday evening, but many cruisers go for the weekend. For a mere $10 per person, the club provides the salmon, covered pavilion with heaters, and barbecues. Ten slips have been reserved – slips G1 – G10. Please call to reserve your slip early, Port Orchard Marina, 360-876-5535. Dinner will be at 6:30 under the pavilion. BYOB, Bring Your Own Chairs, along with a dish to be shared, beverages, cups, plates and utensils. Boat Names beginning with A – M bring a salad, and N-Z bring a dessert. RSVP is required for this event in order to purchase the right amount of salmon. Watch for your EVITE, and if you have not heard by September 21, let me know. Patricia@Shannon-Garvey.com. Port Orchard Marina is accessible by car as well as boat. The town is crazy cool with ‘antique’ stores, and delicious food spots. It even has a nice art gallery. There is a Farmer’s Market on Saturday near the marina, 9 – 2. See you at Port Orchard. Summer Adventure by Pat Hillis. By now, a good percentage of SBYC has heard about Olele’s wanderlust while we were at Sucia in August. For those who haven’t (and there’s a lesson in this). . . . So there we were in Echo Bay, on a lovely summer day, with Reverie (Julie and Roger Newby’s boat) rafted to us. We’d spent the previous evening eating, drinking fine wine (and other things) and playing cards. As the night closed in, we decided to get up early and make the walk the next morning to Ewing Point—a little more than four miles. And we did. After reaching the point, sitting around, having a bite to eat, we headed back. Just then, Jerry’s phone rang. It was from no less than the Adventuress saying she had our two boats rafted to her, having corralled them as they dragged anchor and headed out to open waters of Rosario Strait. With a boatload of adult passengers, Adventuress was ready to head out herself, but had to wait until we hot-footed the two miles down the trail, leapt into the dinghy and roared out to her. As it turned out, there was no one more gracious than the skipper Zeal and the two young women who lassoed the wayward boats, pulled the anchor (with instructions by phone from Jerry) and brought them safely alongside. What made this experience somewhat rewarding (we have no idea why Olele dragged anchor as we’d been moored in the spot for more than 24 hours) was that last summer, we saw an escapee boat with no skipper on board and helped (a bit) with many others, to get her stopped. The boat had a phone number in the window and someone was able to call the owner who hustled down to reclaim his boat. Following that, Jerry posted our phone number in the window and that’s how Adventuress knew to call us. Without the lesson from a year ago, we’re not sure what would have happened. I guess Adventuress would have waited until we strolled back, interrupting her own voyage. Now, whenever we leave Olele alone, Jerry holds up his hand, palm toward Olele and says, “STAY!” So far she’s obeyed.